Acer, a few days ahead of MWC 2015, has started teaser the products it intends to launch at the trade show. The firm has uploaded an image on Facebook teasing the smartphones and wearables due at the event. 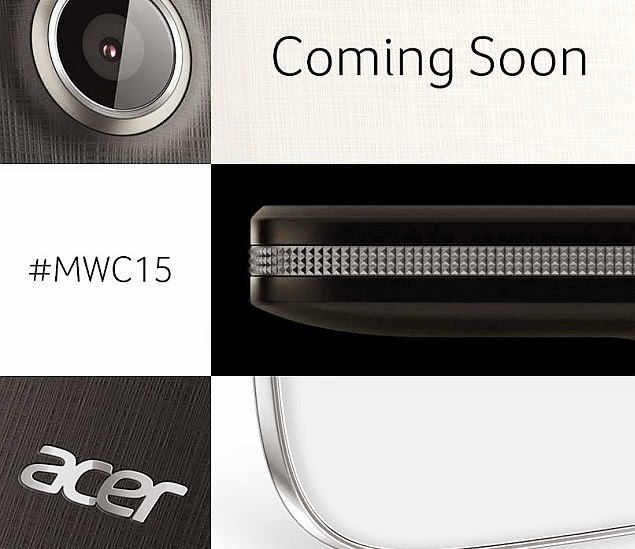 The teaser image by Lenovo showcases parts of different products along with the text "#MWC15" and "Coming Soon." The image caption clearly states a 'smartphone' and a 'wearable' set to be launched at MWC 2015. "Out with the old, in with the new. Get ready to meet our new smartphones and wearable @ Mobile World Congress 2015 GSMA Mobile World Congress," says the caption. The three parts of smartphones are seen in the teaser image, including a camera module, a side bezel with fashionable patterns and materials, and a lower corner of a smartphone. Nothing can be confirmed until Acer finally launches the product at MWC 2015. Acer is not new to the wearables market as last year it launched the fitness-tracking band called Liquid Leap. The band is until now Acer's first wearable device, as well as its smallest touchscreen device with a 1-inch display. Like the Liquid Leap, the upcoming wearable might also be able to offer functions like fitness tracking, call and SMS notification, as well as music control. Notably, Acer last month during the CES 2015 event launched its affordable Liquid Z410 smartphone. The highlight of the Acer Liquid Z410 budget smartphone is that it supports 4G LTE (Cat. 4) connectivity and packs a 64-bit quad-core (unspecified chipset) processor.